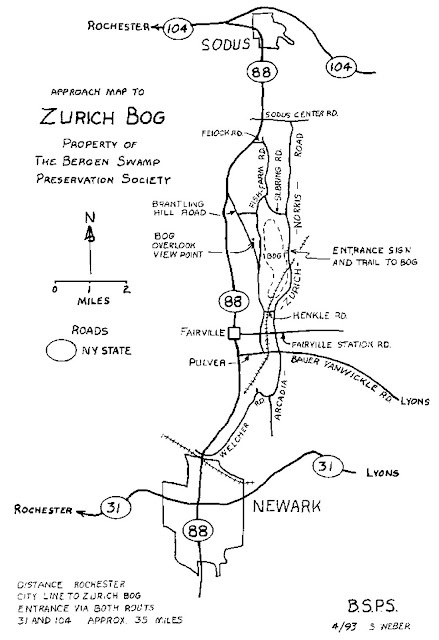 Join Trail Works for a hike in Zurich Bog at 10:00a.m. on 10/9/10. We shouldn't need insect repellent but sturdy, water repellent footwear is recommended. Bogs are notorious for soggy, uneven ground and Zurich has it. The pitcher plants, sun dews, Labrador tea and other bog residents won't be blooming but you will be surprised at the Autumn beauty that this unique habitat provides. Please mark you calendar and plan to join us. 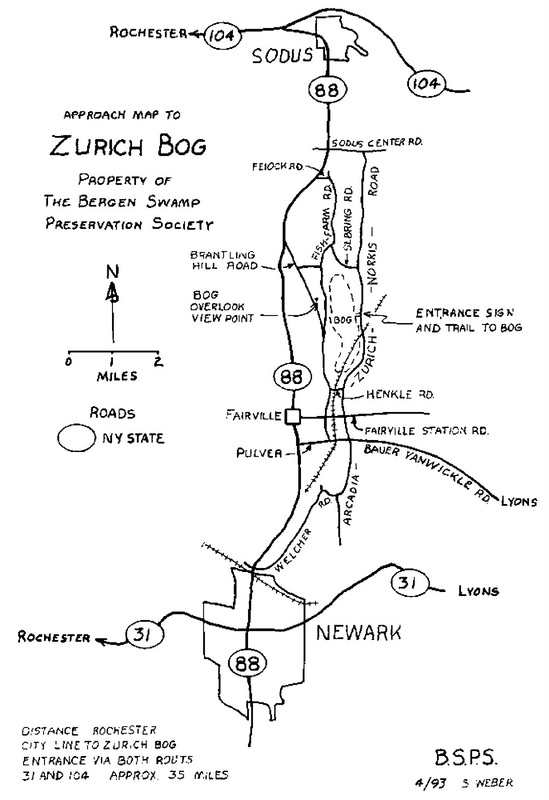 Zurich Bog in Arcadia, NY is a National Natural Landmark and is the property of the Bergen Swamp Preservation Society. Take Route 104 East. From the junction of Routes 88 and 104 near Sodus, turn south and follow Route 88 for 3.3 miles. Turn east onto Sodus Center Road. After 0.8 miles, turn right onto Arcadia-Zurich-Norris Road. Follow it south for 3.8 miles to the bog. The entrance on the right side of the road is marked with a boulder and a sign. Take Route 31 East. From the junction of Routes 31 and 88 in Newark, go north on Route 88 for 1.2 miles. Just over the railroad bridge, turn right onto Welcher Rd. and proceed north on Arcadia-Zurich-Norris Road. After 2.6 miles, you will cross railroad tracks. After another 0.3 miles are a boulder and a sign marking the entrance. Follow the dirt track and hedgerow back to the trail. Do not trespass on the neighbors’ fields. 0 Comments to "Trail Works Outing in Zurich Bog"